Nintendo Switch owners are already spoiled for choice when it comes to high quality twin stick shooters, not to mention games with a strategic focus. It’s rare for a game to merge strategy and action as seamlessly as X-Morph: Defense does, though, and Developer EXOR Studios has worked miracles in transitioning a more or less full-fat version of it onto the Nintendo Switch. Dynamic tower defence and frantic shooting meet in this excellent addition to the Switch’s library, but is it the kind of game you want to unwind with on a long commute home? Probably not, actually, but X-Morph: Defense is still an incredible addition to any Switch collection. A lengthy campaign mode begins by introducing the player to the unusual concept that they will play as a parasitic alien race invading the Earth. 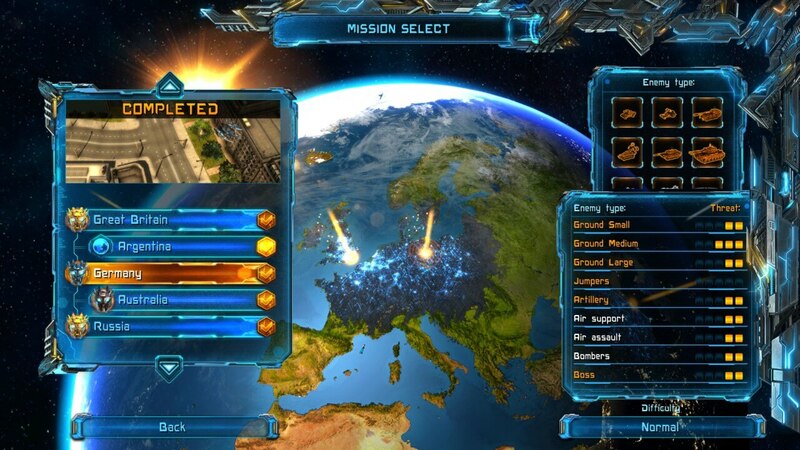 Over the course of the game, alien power cores will crash into key cities around the world, whilst human defenders struggled desperately to destroy them. The player controls the titular X-Morph — a powerful, customisable ship that is capable of building static defenses when needed, as well as playing a direct role in defense of the core. 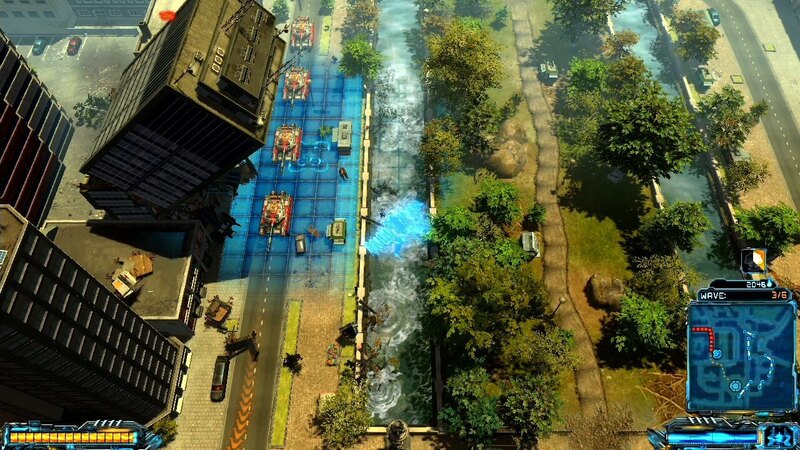 In addition to the campaign mode, X-Morph: Defense also includes an endless survival mode in the base game, as well at least two additional campaigns that are available as paid DLC. This review doesn’t relate to those additional DLC options, since we didn’t have access to them, but I have completed the campaign on multiple difficulty levels and experienced numerous plays through the survival mode. As I mentioned earlier, X-Morph features two very distinct styles of gameplay that link seamlessly in game. Each mission begins with the power core precariously located somewhere on one of the gloriously realised and exceptionally well designed maps. The set dressing is always relevant to the country in which the fight is taking place, with examples including open deserts, densely packed cities, thick jungle and industrialised canyons complete with silos and mining equipment. No matter where the battle takes place, the only strategic difference is the way in which paths weave their way through the scenery towards the core. During the first phase of each level, the player will have essentially unlimited time to set up defences and prepare for the fight. This is achieved by putting the X-Morph into “ghost” mode, which allows it to construct various defensive structures and laser fences. During these sequences, the player is always able to see which of the entry points into the level the human forces will use, as well as roughly what kind of units will be sent — light, heavy, infantry, etc. This allows the player to plan their strategy for each wave and crucially, between waves, it can allow for defences to be sold and then repurposed in another location. There’s no time pressure if all you want to do is complete the mission with a basic score, but chasing the best possible ranking forces the player to place towers whilst enemies are still coming — this can be slightly fiddly with the Switch controls, but it’s by no means a game changer. 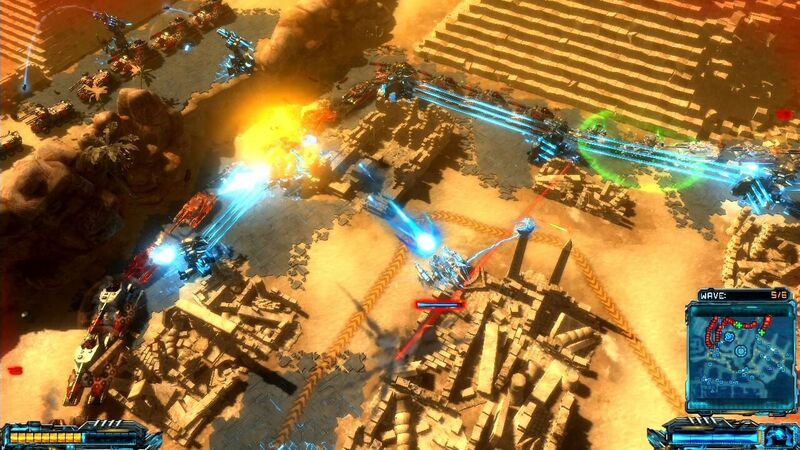 When the waves of enemies do come, X-Morph really comes into its own among other tower defence games, thanks to the frantic twin stick combat. The X-Morph begins with a basic rapid fire laser, as well as a charged shot attack. Various upgrades throughout the game expand this arsenal to include a powerful laser beam, bombs, air to air missiles and several secondary attacks that do devastating amounts of damage. To survive the later waves of any mission in the second half of the game, you’ll need to switch between these attacks and manage the X-Morph carefully, since some enemies are resistant to lasers, missiles or one of the other attacks. Enemies tend to come from two to three directions at once and waves will often feature a mixture of different ground units, as well as several kinds of aircraft. Most enemies will head directly towards the power core whilst also firing on the X-Morph opportunistically, but some (mostly aircraft) will target the X-Morph and are there, really, to act as a distraction. 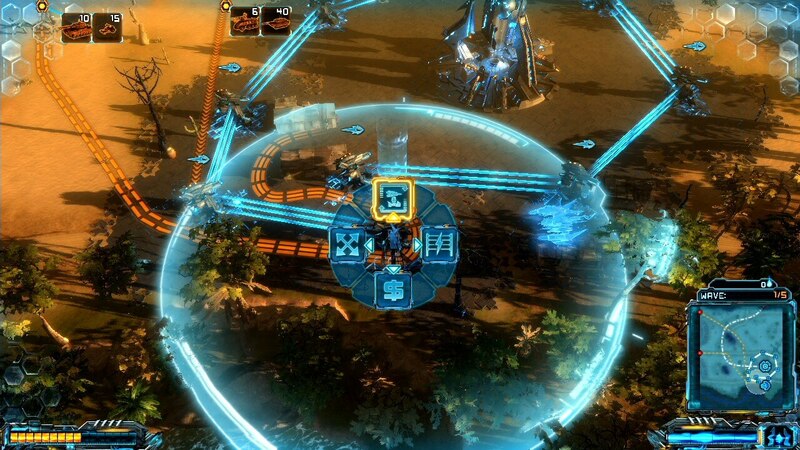 Other units will aim to take out the defense towers, which is arguably a more serious consideration given that laser fences between those towers are the most critical consideration when it comes to winning or losing. Key to success in X-Morph is positioning towers (and the fences that run between them) to drive enemy waves around the maps in such a way that they take as much time (and damage) as possible. Some maps feature buildings that can be toppled to block a road, or bridges that can be blown — be careful though, because you can never block the last route, and taking out a bridge (if it is the last route) will cause a laser fence to go down somewhere else. Resources are always just a little shorter than you would like, so it’s important to balance your defenses across all of the potential routes. 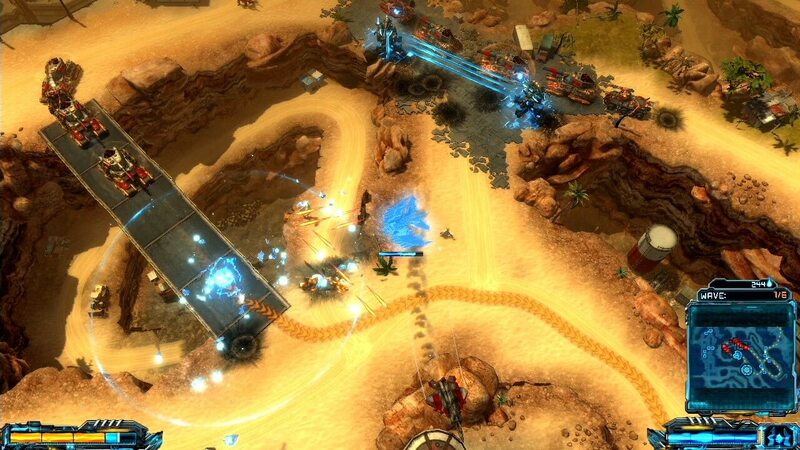 The X-Morph itself is very powerful and this is reflected by the volume of enemies sent at the core. There are very few levels where the player can reliably set up their defenses to do all of the work for them, whilst conversely, the X-Morph will never have enough time to stop every single enemy on its own. This leads to a really nice balance between the two styles of play, with both strategic thought and tactical skill being important. Visually, X-Morph is one of the best looking Switch games that I’ve played in a long time. The maps are large and detailed, with very individual setups that make them all feel unique, even if there is some copy and paste among the decoration that furnishes them. The explosions are visually impactful and there are some excellent visual effects, including sparks, smoke, fire and flying debris — it’s very impressive stuff. The sound is just as good, and I have to give a particular nod to the voice acting associated with the human General, who has a real “never say die” mentality. Overall, X-Morph might be a little too intense for a lot of your average mobile use cases, but it is still superb when played either on the move or when docked. The Switch controls are exceptionally tight during shooting sections and not at all bad during the fiddlier moments when building is required, but the lack of a time limit (in campaign mode) counteracts that. With a lot of content, a superb look and some very unique gameplay, X-Morph is an easy game to recommend. You can find X-Morph Defense on Nintendo Switch, PC, Xbox, and PS4.